Synopsis: Five years after becoming best of friends, a now 20-year-old Hiccup (Baruchel) and his dragon Toothless spend their time exploring the sky and discovering new lands. 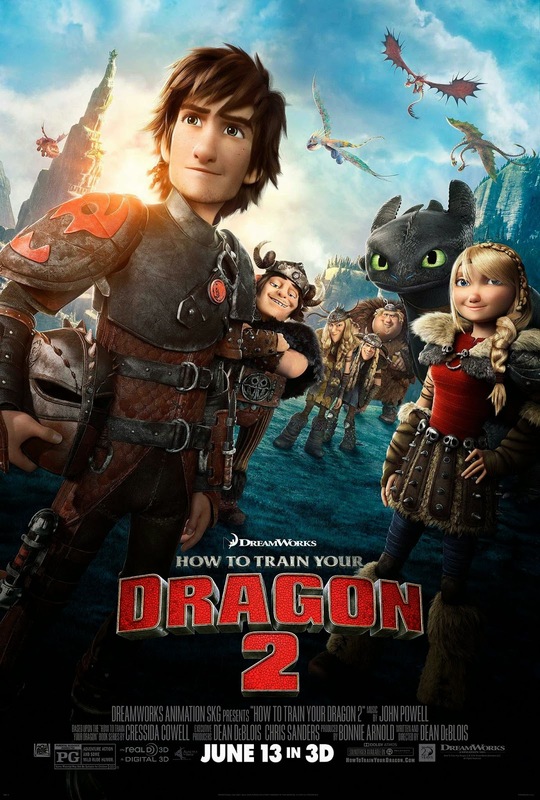 While on one of these explorations, Hiccup discovers the existence of two warring dragon masters: one a vicious Viking named Drago Bloodfist (Hounsou), who's trying to capture dragons to add to his vast dragon army, the other a mysterious dragon master and protector named Valka (Blanchett)…who happens to be Hiccup's long-lost mother. Andrew: Hello readers! Earlier this weekend we caught How To Train Your Dragon 2, the sequel to 2010's hit Dreamworks Animation film How To Train Your Dragon (obviously). This is a film that was released last weekend but we weren't able to catch it until now. Sarah, I don't know about you but this wasn't necessarily one that I was jumping in anticipation for, but more than anything I was curious to see what it would be like in 3D. What about you? Sarah: Oh I was really excited for this one! I really liked the first one so I was looking forward to seeing where they would take this. I was curious about the 3D as well, and I am so glad that we decided to see it that way. From a visual standpoint, this movie was amazing. They were able to do some really cool things with the effects and it just made the whole world come alive. All of the new dragons were very cool and it was just fun to see what all the characters looked like now that it's been five years between stories. One of the many stunning visuals in HTTYD2 is Hiccup's ability to fly alongside Toothless. But I have to say, the story lacked a little bit for me. We get to meet Hiccup's mother, Valka (Cate Blanchett), who everyone thought was dead. Nope! Turns out she's just running this big dragon Humane Society and decided that was more important than her baby. I don't know about you but that just never set right with me. And the way Hiccup just kind of accepts it right away? Like what is that?! A: Yeah, the idea that Hiccup would just immediately accept that this woman was who she said she was and that he was totally fine with her not being there for the first 20 years of his life just felt a little off. I mean, I can imagine that a boy who didn't have his mother this whole time could be somewhat accepting of her remorse, especially since she's some kind of dragon whisperer like he is, but it did seem a little too easy. But it's a kids film, so I'll let it slide. The thing that bothered me the most about How To Train Your Dragon 2 though is that the story and central conflict in and of itself is a little lacking. The first film had a pretty straight-forward yet great concept that Hiccup figured out dragons aren't bad creatures at all and has to get his father, Stoick (Gerard Butler), and the rest of his clan to accept that so they stop warring with dragons. This sequel has a de facto bad guy in Drago Bloodfist (Djimon Hounsou), a dragon master who wants to rule the world using a dragon army, yet at the same time doesn't think very highly of dragons. But he himself doesn't come into the film until pretty late, and even then he's not a very formidable foe to me. He has an "Alpha dragon" that actually controls his dragons and yet he somehow has browbeaten this Alpha dragon into submission and wants to use him to steal all of Valka's and Hiccup's dragons, and I just didn't buy it I guess. I don't know. S: Ok, YES! His character was just really lacking for me. It didn't make any sense that he would have such a dislike for these characters that seem to do his bidding. I really goes against the whole, "Once you earn their trust" thing that Hiccup keeps spouting throughout the whole movie. I was also really hoping for an epic death for this bad guy. Like the Alpha that he controls, finally breaks free of his control and just noms down on him, but no. The whole Alpha thing just really didn't make a whole lot of sense. They're not even the same kind of dragons! They're these ice spitting, fish-dragons or something that are just really huge! I was a little confused. But you're right. It's a kids movie, I guess I'll have to let it slide. I don't know though, I think kids might even be a little confused as to why this giant behemoth of a monster is taking orders from this little dreadlocked pirate. A: Right! It wasn't completely clear to me what Drago's motivations were and how/why the Alpha controls the other dragons. It was just undercooked in my eyes. That was a big flaw to me. This is Drago's Alpha dragon. Kinda feels like this dragon is a little too big to be controlled by a crazy viking, no? That said, I did like a lot of aspects of this film. The strength of the film is how it looks. The 3D is fantastic, the animation is amazing, and like you said earlier they did some really cool things with effects like a scene where Hiccup is surrounded by a bunch of dragons who all start up fire in their mouths to provide light and it looked awesome. I also enjoy how the great cinematographer Roger Deakins helped as a visual consultant here just as he did for the first film. It really shows in how the film's world looks. So that was great. The dragon designs were all very cool and creative again, which was a strength of the first film. They even added a thing or two to Toothless that made him even cooler. But let me ask you this, Sarah: what did you think of the voice acting in this film? S: Well, here's the thing. For the first one? It totally worked for me. They were all these young, dorky kids and their voiced reflected that. But they're older now, and while I realize all the actors who voiced them are full grown, it just didn't seem to fit any more. Butler, Ferguson and Blanchett did a fine job because their voices seemed to just fit better; but Baruchel and Ferrara? They were not as good for me. The voices just didn't match the bodies. Now, there WAS a voice that you were able to pick out that I didn't right away, that fit into the role really well and that was Kit Harrington (Game of Thrones). We didn't see his name anywhere with the marketing for this movie! He definitely fit into the animated world pretty well I thought. A: Ok yes! Thank you! You just spelled out my exact feelings on the voice-acting in this film. Like, pretty much took all the words out of my mouth. The voices for the younger characters, who are now 20 years old, just don't quite fit like they did in the first film. Baruchel in particular…while I like Jay Baruchel in general and thought he was a perfect choice for Hiccup the first time around, his voice just does not work for me when coming out of 20-year-old Hiccup's mouth. It kinda took me out of a lot of scenes. American Ferrara, T.J. Miller, Kristin Wiig, and Jonah Hill's voices didn't quite work for me this time either as Hiccup's friends. The only one of the younger group that still worked for me was Christopher Mintz-Plasse for some reason. Also, didn't realize this until we started writing this, but for the life of me I can't remember the names of any of Hiccup's friends besides Astrid (Ferrara), so that isn't a good sign for the film. But you're right with the adult characters. They all still worked just fine, Blanchett was a nice addition, Hounsou was a good choice for Drago even if his character is kinda thin, and I thought Harrington was a great addition as Eret, a dragon trapper who works for Drago so he can build his dragon army. Eret was given plenty of screen time, too, which I liked because I found his character more interesting this time around than Hiccup. But I'm so glad you said what you did because I thought I was gonna catch you off guard with my thoughts. S: Psh. Please. Catch me off guard… but seriously. But what else could they have done? The only thing I can think of was not making Hiccup look so much older. Astrid didn't look that much different (to be fair, I didn't think she was such a great choice for the original one either) and the other characters aren't really in it enough to make that big of an impact. So, overall, it was a little disappointing as far as story line goes but man was this a pretty movie. We do have to remember though, this is a kids movie and while we might not have loved it, we definitely were not the target audience. A: I'll also give the film credit for going in a certain direction that I was not expecting. Again, won't spoil what that is here, but it did keep me on my toes for a large portion of the film, and I enjoyed the interactions between Gerard Butler's Stoick and Blanchett's Valka once they've been reunited. That was maybe the strongest part of the film to me outside of the visuals. So let's wrap this review up. What are your final thoughts on How To Train Your Dragon 2, my dear? S: Well, I think if you have kids who were fans of the first one, you should check it out in a matinee. And definitely don't waste your time seeing it in 2D. 3D is the way to go with this one. Everything just looks so much better. If you were luke-warm on the first one though, I would say you can skip this one all together. I actually really thought they wrapped the first one up nicely, it didn't really beg for a sequel. I'm going to give this one a 2.5/5. A: I definitely think it's a good one to see in 3D, and it's a good one for older kids but maybe not so much the younger ones. I liked the first film in this series, but I didn't like this one nearly as much which is disappointing. I agree with your sentiment that it didn't beg for a sequel, but I understand why they made it. At least they made it visually stunning so it was interesting to look at. I'm going to give it a bit of a higher score with a 3/5. FINAL VERDICT: A good weekend matinee to take the kids to, otherwise just Netflix it.